Building links for your website is definitely a must, if you want it to gain a place on the first page and if you want it to rank among the best webpages, out there. However, this doesn’t have to mean that you should be the one conducting this endeavor. As you may have guessed it, this is a laborious and quite boring process, and therefore you may desire to pay somebody else, in order not worry about links. Thehoth.com is definitely right for you and as you will see in the following lines, it has numerous features that will practically convince you to choose it. If you are curious to learn what the hoth could do for you, then kick back, relax and read this post. Let’s talk about the money, because this is definitely an important matter. Well, here you will find prices ranging between $60 and $350, depending on the program you will choose. But, those who will spend more, i.e. $1000 + will benefit from a 12.5% discount, a priority queue placement and a great service rep, from Monday to Friday, thanks to the bulk buyer program. Because I began talking about money, I would like to continue on this note. 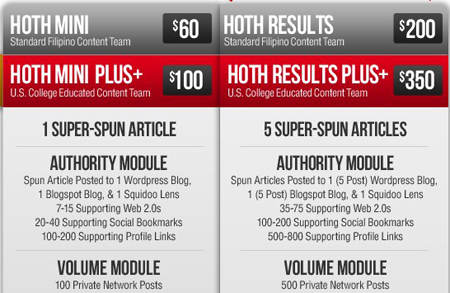 In order to understand how this guarantee works, you should know more about thehoth.com service. First of all, you are asked to send the keywords and the URLs that you want to rank for and pay for your order; then they are verifying your order in order to see if there is something wrong with it, after the completion of this processyour order will be placed in their queue, at which point you will receive a guaranteed delivery date. Well, if they do not respect this date, you may contact them in order to get a full refund. Simple as that! As you can see, with the Hoth, you will simply have to submit your keywords and the URLs. What you will do with the .txt reports, after you receive them is nobody’s business but yours. Therefore, if you would like to keep them for yourself or if you desire to resell them is definitely your choice, since these won’t contain logos, taglines or other contact details. People are usually reluctant in contacting a link building service, precisely because they believe that this represents another stress and time consuming factor. Well, if you too desire to skip the paper works and rapidly resell the product you have just bought, then you will definitely believe thehoth.com is the right agency for you. They simply desire to create a helpful and stress free environment for their customers, and as a result there are no agreements, contracts or permissions needed. If you desire to increase your revenues, you could make part of the affiliate program. This means that you should refer clients to the hoth and then you will receive a 25% commission on all purchases that the client makes in the first 60 days. These being said, these are the most five important features that will make you pick thehoth.com.